Maalouf Ashford & Talbot has been named "Oil & Gas Law Firm of the Year" in the United States for the past 7 years in a row (2011 - 2017). In addition, Maalouf Ashford has been named "Oil & Gas Law Firm of the Year" for 2017 in the Kingdom of Saudi Arabia, United Arab Emirates, Lebanon, Brazil and China, as well as "Oil & Gas Law Firm of the Year" for 2016, 2015, and 2014 in the Kingdom of Saudi Arabia, Lebanon, Brazil and China, and "Oil & Gas Law Firm of the Year" for 2013 in the Kingdom of Saudi Arabia, Lebanon and Brazil. Kingdom of Saudi Arabia, Brazil, China, and the United States. Kingdom of Saudi Arabia, Brazil, China, and Lebanon. Kingdom of Saudi Arabia, Brazil, China, Lebanon, United Kingdom and Russia. ACQ Law Awards - 2014 Maalouf Ashford & Talbot Named "Oil & Gas Law Firm of the Year" for 2014 in the United States. Global 100 Awards - 2013 Maalouf Ashford & Talbot Named "Oil & Gas Law Firm of the Year" for 2013 in the United States. ACQ Law Awards - 2013 Maalouf Ashford & Talbot Named "Oil & Gas Law Firm of the Year" for 2013 in the United States. M&A International Law Awards - 2013 Maalouf Ashford & Talbot Named "Oil & Gas Law Firm of the Year" for 2013 in the United States. Kingdom of Saudi Arabia, Brazil, and the United States. ACQ Law Awards - 2012 Maalouf Ashford & Talbot Named "Energy Oil & Gas Law Firm of the Year" for 2012 in the United States. 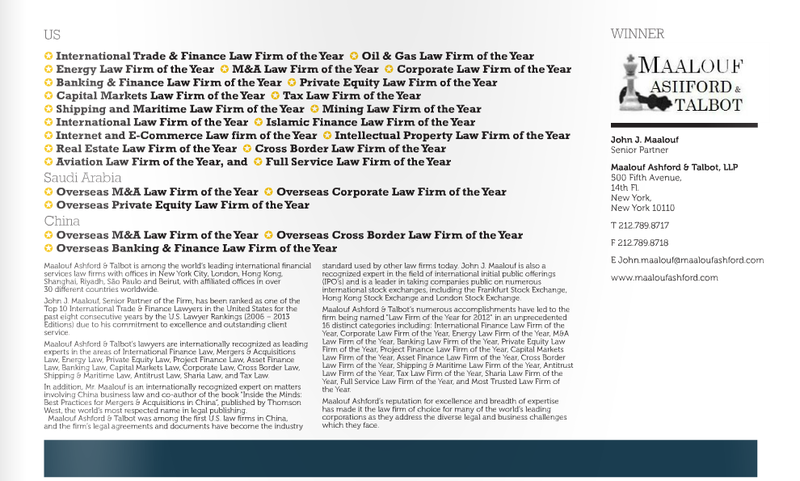 ACQ Law Awards - 2011 Maalouf Ashford & Talbot Named "Oil & Gas Law Firm of the Year" for 2011 in the United States. Corporate International Legal Awards - 2011 Maalouf Ashford & Talbot Named "Oil & Gas Law Firm of the Year" for 2012 in New York. The Middle-East is currently in the midst of an historic period of economic growth and financial prosperity. We represent clients in all types of transactions related to the oil, gas and energy industry throughout the Middle-East, United States, China, Russia and the world. Our Oil & Gas practice group has developed a reputation for providing high quality and cost-effective representation in complex transactional, regulatory and litigation matters. LNG is a core practice area at Maalouf Ashford & Talbot. Through our offices in New York City, Riyadh, Beirut, Sao Paulo and Hong Kong, we actively assist clients worldwide in all aspects of LNG matters. As a result, lawyers in our LNG practice group are widely recognized as the most experienced and respected LNG specialists in the world. commercial operation of the FSRU. water desalination and wastewater treatment in Indonesia. development of an LNG facility with the capability of processing up to 6 million tonnes per annum. natural gas-fired, simple-cycle power generation facility. gas pipeline project, a US$680 million LNG expansion project and US$550 million refinery debottlenecking project. and expansion LNG projects in Africa, Asia, the Americas, Australia and the Middle East. ▪ Representing France based company in the construction of an LNG receiving / regasification terminal in the EU. ▪ Representing leading Japanese LNG buyers in their negotiation of new and amended LNG sale and purchase agreements. ▪ Representing clients in connection with long-term Sales and Purchase Agreements for supply of LNG. ▪ Representing clients in connection with long-term LNG Portfolio Supply Agreements. LNG spot, swap and other trading transactions. ▪ Representing clients in connection with structured financing for large scale LNG project secured by long-term LNG supply contracts. Major U.S. transactions - including corporate acquisitions; sales and purchases of producing properties, pipelines, and other significant assets; restructuring; representation on due diligence, bids and related financing issues. during the bidding, negotiation and performance of exploration and production contracts. Exploration and production services - including the drafting and negotiation of leases, operating agreements, farm-out agreements, production purchase and sale agreements, exploration agreements and other routine oil and gas questions affecting daily business operations. Environmental counseling and regulatory services - including compliance with federal and state guidelines, defense of enforcement actions, assistance in permitting and other administrative proceedings, site analyses, risk assessments and advice on the effect of the environmental laws on business transactions. concerns; and the purchase and sale of pipeline assets and facilities. ▪ The acquisition and sale of producing and undeveloped properties. ▪ Representation of shippers and transporters in connection with a variety of marine transport matters. ▪ Assisting in the acquisition and sale of refineries and marketing operations. Maalouf Ashford & Talbot attorneys represent clients in all aspects of technology transfers and inlicensing transactions. Our attorneys and team of technical experts draft and analyze computer software, hardware, internet, telecommunications and related technical agreements. In addition, Maalouf Ashford & Talbot offers a full range of services regarding the registration of trademarks, service marks, patents, and copyrights. As the public sector plays a key role in the economy of many Middle Eastern countries, the Firm has significant experience in public sector procurement laws and regulations as well as government contracts. The Firm has assisted and represented clients in government tenders related to oil & gas, utilities, defense, constructions, and transportations. Our attorneys have also represented clients in disputes with various Middle East government agencies and departments. Moreover, with the increasing importance of privatization in the Middle East, Maalouf Ashford & Talbot has significant experience in advising clients on privatization issues and assisting in the implementation of privatization projects.